The crippling effects of Michelle's 11 years long battle with RHG Mortgage Corporation (formerly RAMS / Westpac) would be more than the average person could bear. Mortgage fraud, bullying and breaches of civil and criminal law are just some of the tactics this 2nd tier lender have used to conceal their concurrent wrongdoing. RHG has remained under the radar of the scrutiny of the banking Royal Commission and ASIC the Australian regulatory body have refused to investigate them. The longterm affects - mental illness, loss of career, loss of family well-being, significant and serious physical illness. 11 years have been stolen from this family. 2007 MM was told by an agent of the bank MM could afford a home based on their budget audit despite MM working part-time and studying. Six weeks later MM contacted RAMS (RHG) saying she was doubtful she could manage this deal. RHG ignored the notice and sent a letter claiming that all due diligence had been actioned. For five years MM worked three jobs around the clock to try to keep payments up. 2012, MM requested her file held by RHG. The original loan application of 4 pages had another 11 pages added that she had never sighted. The loan type was designed for small businesses and self-employed, not a first home buyer. RHG manipulated 31 interest rate rises in 5 years and repayments of up to $3,800 per month on a low single income with dependents. The lender continued to move the goal posts every week so she would call them and ask how much they needed this week just to keep the roof over their heads. MM sold personal assets, all superannuation used, increased credit card debt to make each repayment. MM's mother has sold assets, emptied her superannuation and sold her home to enable MM to keep her house. Financial Ombudsman result - dispute found in her favour, maladministration was proven, liability – 50% onus on the bank for their wrongdoing, 50% onus on MM for failing to protect herself from their wrongdoing. MM refuses Determination as it forces her into homelessness. She could not have protected herself from this type of deception and fraud. Credit and Investment Ombudsman found no issue with the lender's legal counsel and the lender's conduct during the 'good faith' negotiations. Internal emails showing the advisor and lending managers communication to construct the loans after obtaining MM's signature. Multiple internal (bank) diary notes obtained at different times that are all different and have been altered. The lender, RHG Mortgage Corporation's diary notes show clearly that they were aware of the fraud from the loan inception and throughout the loan time. MM has not had much help from FOS, CIO, ASIC, APRA, Federal Members, Senate Inquiries, NSW Fraud Squad, local Detective, social justice law firms, or pro bono mediators. MM is now restricted to night shift work only to enable her to continue to work on saving her home and preventing her family from being homeless. Longterm affects include mental illness, loss of career, loss of family well-being, significant and serious physical illness. 11 years have been stolen from MM and her family. Commencement of illegal repossession whilst matter with Ombudsman. See Part 2 of Michelle's story for more information. Interview with Leon Ashby (LA) 14th August 2018 - Extending The Bank Royal Commission, recorded at Parliament House, Canberra ACT Australia. LA: How long have you been trapped in mortgage fraud with RHG Mortgage Corporation, previously known as RAMS/WESTPAC for? MM: It will be 11 years next month. LA: As a first home buyer, what type of loan product did they provide to you? MM: They provided a small business style loan and the bank's agent and bank's lending manager obtained an Australian Business Number without my knowledge. LA: When did you notify the bank there was an issue with the loan and serviceability? MM: I contacted the bank less then 6 weeks after moving in, to let them know that something was wrong....they denied that there were any issues and claimed they had applied due diligence. That was October 2007. LA: After waiting two years for FOS to determine your matter, why couldn't you accept your FOS Determination that was in your favour? MM: The Determination would have left my children and me homeless, the FOS apportioned liability, 50% onus on the bank for their wrongdoing and 50% onus on me for failing to protect myself from their wrongdoing. There's no appeal mechanism for any of these dispute schemes. LA: Could you have protected yourself from their wrongdoing? MM: No...the banks employees and their agents added another bundle of pages to the original loan application after obtaining our signatures. These pages contained fraudulent information including the increase of my income by $55,000, a rental property I never owned, $100,000 in savings that didn't exist. I was never provided with these pages of the application. 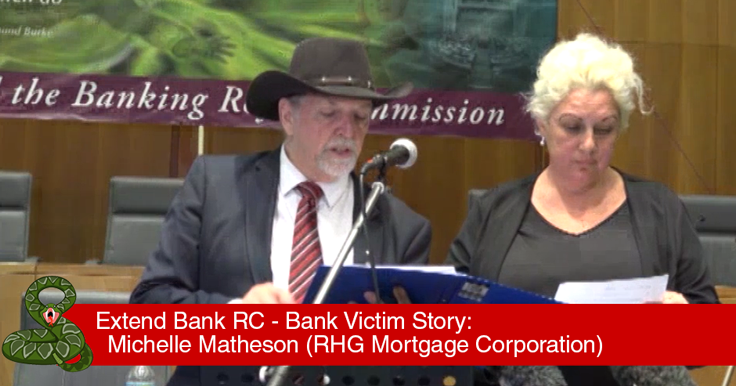 LA: Has RHG Mortgage Corporation been mentioned at all during the Royal Commission? MM: No, not at all, not once. I know there is a very large group of customers of RHG Mortgage Corporation that are dealing with these types of fraud and unlawful conduct, most have already lost their homes, but no one will investigate this second tier lender. Commencement of illegal repossession while matter with Ombudsman. Michelle is a strong woman who has been fighting the banks for 11 years. Not just for her case and family, but she is a staunch advocate for other bank victims and the cause that seeks to see the banking and financial services sector in Australia cleaned up. Michelle wants and deserves Justice and compensation. A new twist in the saga with RHG Mortgage Corporation's corrupt behaviour and proven fraud is the commencement of illegal repossession process while the matter is with the Ombudsman. This comes about shortly after Michelle Matheson's attendance at Parliment House to share her story in the extend the Banking Royal Commission event and her story being shared in Parliament by her local MP, Pat Conroy. Michelle is not alone - we know of at least four bank victims cases (who spoke up in Canberra on 14th August 2018) that have been progressed to further legal action for eviction, repossession and other such deeds. Maybe the banks & financial services are trying to shut them down as while legal proceedings are underway, the cases cannot be heard by the potentially extended Royal Commission. Join In - People-power Needed! "Various rights and duties have been conferred on banks by legislation, the most important of which is the exclusive operation of the payments system and the unique ability to create credit."